Caption: The hawksbill sea turtle (Eretmochelys imbricata) is a critically endangered sea turtle belonging to the family Cheloniidae. It is the only extant species in its genus. The species has a worldwide distribution, with Atlantic and Pacific subspecies. E. imbricata imbricata is the Atlantic subspecies, while E. imbricata bissa is found in the Indo-Pacific region. The hawksbill's appearance is similar to that of other marine turtles. It has a generally flattened body shape, a protective carapace, and flipper-like arms, adapted for swimming in the open ocean. E. imbricata is easily distinguished from other sea turtles by its sharp, curving beak with prominent tomium, and the saw-like appearance of its shell margins. Hawksbill shells slightly change colors, depending on water temperature. 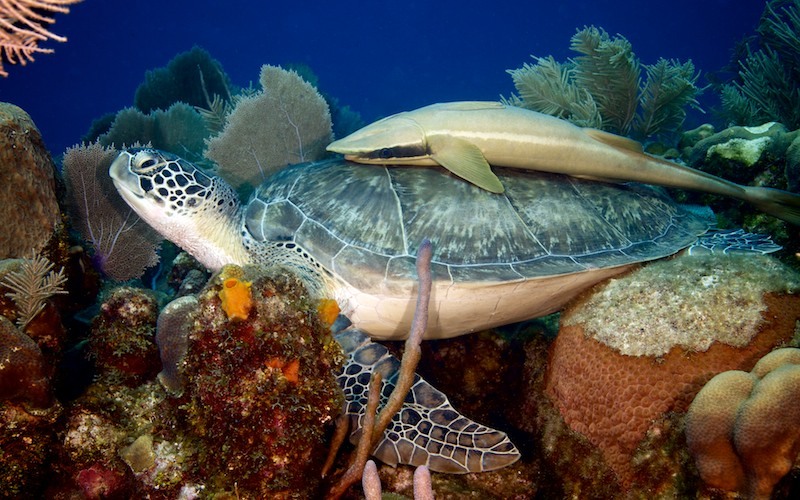 While this turtle lives part of its life in the open ocean, it spends more time in shallow lagoons and coral reefs.